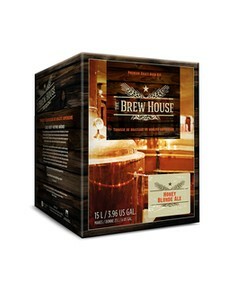 Brew House beer kits provide high-gravity worts made entirely with malts, adjuncts, and hops, with no additives or extracts. With no boiling – just stirring and careful racking – the Brew House kits produce true-to-style craft beer, made with the same ingredients and methods used by professional brewers. Stylistically positioned between a German altbier and Oktoberfest, our red ale is copper-red in color. It has a pronounced, crisp, malty character, with delicate hop bitterness and a pleasing floral aroma. Blessed with all of these thirst quenching attributes, this beer is sure to please! Recommended serving temperature is 54 °F (12 °C).